The conclusion of industry analysts is while new boaters come and go, the core of long-term sailors is stable. Those of us that become addicted occasionally sell a boat, but then by replacement. That's certainly my story, having owned a beach catamaran, Stiletto 27, PDQ 32, and now a Corsair F-24 Mk II. 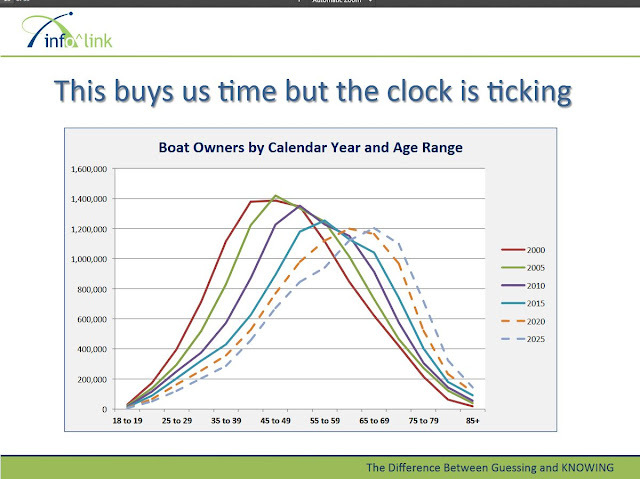 Unfortunately, new boat owners come, but mostly go. As a result, boating is in gradual decline. Some point to New Age alternatives--the internet and other sports. Some correctly point out chartering is on the rise--boat ownership and all of the maintenance that goes with it is a good fit with the new generation. Small boats are still a healthy industry. My daughter, for example, would love a sailing dinghy and I'll bet she'll buy one someday. But you can't see her owning a bigger boat. It wouldn't fit her needs, and the maintenance and fiddling would never hold her attention. I can see that. It feels pretty irrational at times to me. The result is that we sailors are getting older and older. It doesn't just seem that way, it's true. I'm okay with that. By the time the sail population ages enough that my target market has evaporated, I'll have run out of things to write about. I had the very same conversation with a mate of mine just last week - all the cruiser owners in my sailing club are.. ahem... of advanced aged (and I include myself) and precious few sub 30 year old's coming through..
We all leave things behind. I downsized a year ago and I'm sure I will again at some point. I wonder how downsizing figures into the stats? From what I see, most sailors keep buying bigger boats, until one day they quit. I'm sure it depends on why you sail and what you like. It needs to stay fun. Wow, I'm a little bit on the front side of that wave. Hope I don't wipe out. First print edition, 2018, by Seaworthy Press. About 156 pages. “Rigging Modern Anchors” demystifies anchoring with today’s modern anchors. Through years of systematic testing, Drew Frye has produced a new benchmark of understanding based on empirical data instead of anecdotal wisdom, passed down from one sailor to the next without proof or deep understanding. In “Rigging Modern Anchors” we dig deeply into the how and why of anchoring, using hard numbers as our foundation. Included are in-depth discussions of anchoring basics, loads, scope, and the effects of cyclical loading, soil consolidation and bottom characteristics on holding power. Special attention is given to problem bottoms such as very soft mud and rock. 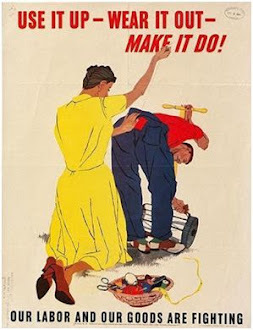 There are anchor-specific observations, discussions of tandem anchors and rigging methods, plus an extensive appendix containing test data, open source designs for bridle plates and anchor turners, strength and toughness for various chain types, anchor connector recommendations, anchor sizing guides and more. Proper anchoring technique, rigging, and gear selection is vital to the safety of ship and crew. 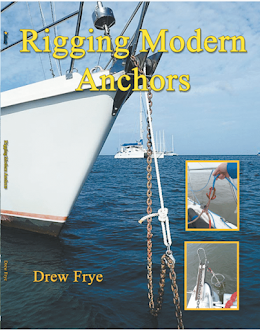 Instead of hoping your anchor and rigging scheme will hold, read “Rigging Modern Anchors” and be sure. 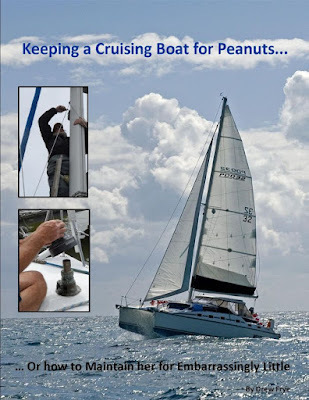 Keeping a Cruising Boat for Peanuts--Available in PDF! 2017, Kindle, about 425 pages, $9.99. Buy now in PDF, 410 pages. As much as I love sailing, putting my daughter through college and funding my 401K are more important. Transitioning from professional engineer to writer has transformed my habit of living efficiently into a passion for spreading funds thin. I like to think of it as a challenge for the imagination—it’s more fun that way. I’ve written over 200 equipment reviews and engineering articles for popular sailing magazines, all based on laboratory and hands-on testing. I’ve spent 30 years learning how to maintain, fix, and upgrade. I've also spent 35 years as a chemical engineer, and my wife thinks I live in my basement shop. As a result I’ve become a fair hand most crafts, never get stuck in the field with something I can’t fix, and I've learned to spread money thin, without compromising speed, reliability, or performance. Although I've written on many topics, my wife assures me this is the one I know best. My magnum opus? Blog - 1955 S&S Restoration. Just beautiful. This is my place to share my enthusiasm for the Chesapeake Bay, Delmarva Peninsula, PDQ And Corsair F-24 specific minutia, and sailing in general. As a regular contributor to sailing magazines including Practical Sailor and Good Old Boat (over 150 articles), it provides a place to try out ideas and publish the overflow. Here I can blurt it out half formed ideas, collect comments, and to see what questions my inquiry suggests. If I need to get long winded or philosophical, it’s my space to do so. After 15 years of kayaking, 35 years of sailing, 35 years of rock and ice climbing, and 40 years as a chemical engineer, I still have much to learn and my life is still one giant science project. My end of the pier is always festooned with test rigs and warning signs. Every research project brings surprises—things I didn’t know, and just as often, things no one knew. And so through books and articles, I share. Voluntary Subscription. No firewall, but considerable expense and labor go into the testing. ...which simply means please ask first. Some of this material has been published in books or magazine articles, so the publishers have asked me to be clear on this.